Skipton’s JUVIDA Clinics has been selected as an ARTAS™ Platinum Practitioner for excellence in hair restoration surgery. 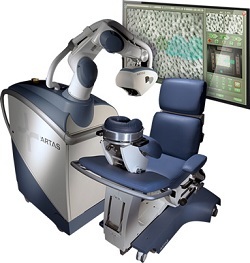 ARTAS™, the global leader in robotic hair restoration, is the first and only robotic hair transplant system. The procedure transplants healthy hair follicles to the target area without the need for the pain, stitches and scarring associated with traditional strip transplant methods. JUVIDA Clinics is the only UK practice to currently hold this prestigious distinction. In order to receive it, a clinic must transplant at least 30,000 follicles per quarter, which equates to 10,000 follicles or more per month. The experience entailed in carrying out these procedures ensures that practitioners at the clinic are national experts in robotic transplant treatments. In addition to this award, the clinic will also be used by ARTAS™ as its European training academy. Aesthetic doctors and surgeons from overseas will travel to Skipton to receive peer-to-peer hands-on training, masterclasses and live surgical demonstrations. Sophie Matthews of JUVIDA Clinics said: “We’re absolutely thrilled to be named as ARTAS™ Platinum Practitioners and to be chosen as the host of its European training academy. This seal of approval in clinical centre excellence is the highest distinction in the work that we do, and recognises that we not only have the knowledge and expertise to produce outstanding results for our clients, we can help other clinics to improve quality of care and aesthetic results”.